CONTACT US TO SCHEDULE A TRIAL LESSON! WELCOME TO PINEAPPLE MUSIC STUDIO! MUSIC LESSONS DELIVERED TO YOUR HOME! Our teachers come to your home, so you can be doing other things around the house while your student has their instrument lesson! Our curriculum is flexible but carefully managed to include learning music fundamentals, composing, arranging, performing and playing a variety of styles of music to create a well-rounded musician. We believe that performing and sharing music is a part of learning to play an instrument. We host two large recitals (each with several sections), a year that all our students are welcome to perform in. 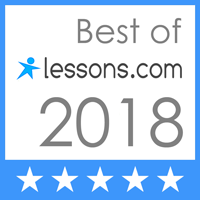 Pineapple’s experienced teachers come to you to bring quality music lessons that are personalized for your student, while offering all the opportunities of a large studio. Our main objective is to help students enjoy the experience of learning to make music so they will be life-time participants in the appreciation of music. Pineapple Music specializes in providing families with quality in-home lessons. Our teachers are excellent musicians and have a passion for teaching music. You can rest assured that students will receive a balanced music education and enjoy their learning in the process! Individual tastes, preferences and learning styles are carefully considered for each student as the teacher prepares their lessons. We provide a multitude of opportunities for every kind of learner and performer.